For preventing respiratory infections and immune dysfunction following physical exercise. Used for treating gastro-intestinal problems. Colostrum is the first form of mother’s milk produced by the mammary glands. For a brief period – the first 24-48 hours of a baby’s life – it is colostrum that provides early nourishment to a breast-fed new-born. This product is bovine colostrum which has similar properties to those of human colostrum. It comes from dairy cows which have just calved and has the advantage of being obtainable in very large quantities. Consumption of colostrum first began in Eastern Europe, but it was during the 1970s in particular, with the resurgence in breastfeeding, that scientists focused on the role colostrum could play in the development of the neonatal immune system. Immunologists subsequently began investigating whether bovine colostrum, rich in proteins, immunoglobulins and growth hormones, could be used to stimulate immunity in humans and to treat a range of health problems - gastrointestinal disorders, respiratory infections, rheumatoid arthritis – as well as in many other areas identified by scientists in studies conducted on the substance. • bioactive essential nutrients used by the body to combat various imbalances or ailments that compromise health. 1. Specific compounds that boost immune response. - IgD: work in synergy with IgM to signal activation of B lymphocytes. • Cytokines, which comprise a large group of important cell signalling molecules. They are essential mediators in immune regulation, specific regulators of epithelial cell growth and development and mediators in the control of inflammatory responses. • Lactoferrin, an iron-binding glycoprotein which fights bacterial growth (particularly Escherichia coli and salmonella). • Lysozyme, an enzyme that destroys bacterial walls and works in synergy with IgA and lactoferrin. • Lactoperoxidase, which protects mammary glands from infection and numerous viruses. • PRPs (proline-rich peptides), short chains of amino acids which promote the growth and differentiation of B lymphocytes and Natural Killer (NK) cells and which ensure leukocyte proliferation. - transforming growth factor, alpha and beta, which are essential for tissue regeneration and cartilage formation. • At a dose of just 1 gram a day – stimulation and strengthening of the immune system. Trials have demonstrated protection against respiratory infections, ‘flu and seasonal ailments. • At higher doses, improvements in physical performance and muscle mass. Research has also shown positive effects on blood cholesterol and triglyceride levels and on ketones, particularly in diabetics with raised blood sugar levels. To gain the most from all these benefits, the recommended daily dose is two capsules of Colostrum standardised to 30% IgG. Very few unwelcome side-effects have been reported from taking colostrum, except mild gastrointestinal discomfort when supplementation is first started. The only potential contraindication to taking bovine colostrum is in the case of allergy to dairy products. 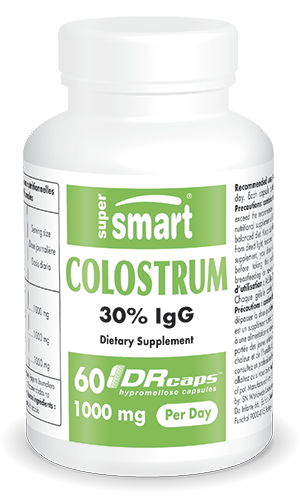 Each capsule contains 500mg of colostrum.